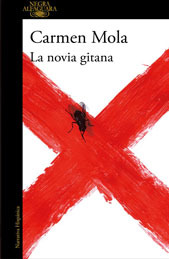 ‘La novia gitana’ (The Gypsy Bride) is the first novel published by Carmen Mola. There is a lot of mistery around this unknown Spanish novelist. To start with Carmen Mola is not her real name, nobody, apart from the person who writes the cheques, knows her identity! That fact adds more even mistery to the novel and has an impact on you when reading her work page after page. And believe me, you won’t put her work down very easily. The plot is very simple, one gypsy bride to be is kidnapped on her way home from her hen party. She was tortured to death and dumped after few days. When the police started investigating realised the MO is similar another killing: her own sister, ans as well, before her wedding. So, you don’t need to be Sherlock Holmes to guess that her killer could be linked or be the same as her sister’s, well, think twice because her sister’s killer is in jail. And from here is where the plot starts twisting with stories and substories that made this novel so entretaining and you wont be able top ut it down until it’s finished. It’s true that La novia gitana has all the cliches in the genre, a tormented police that abuse alcohol (tick), a young police who wants to conquer the world (tick), a badass police who doesn’t go with the rules (tick) and a hacker (tick) and, of course, a twisted psycho (tick tick). But, the problem is not how many cliches you add, the master of Carmen Mola is how she take and mixed them all making her book so enjoyable. One major attractive of this plot is the gypsy culture that Mola describes in the book, so obscure in some sense but at the same time, so intriguing and attractive. The conflicted egos around the four main characters is another interesting part of the book and how she keeps the ball moving around it, fascinating. Hopefully, ‘La novia gitana’ gets translated soon into English so the UK public can enjoy it and remember that not only Scandinavians can write thrillers.